[S182] Social Security Death Index (on-line), Ancestry.com, SSDI, Ancestry.com, SSAN 344-24-4688. [S182] Social Security Death Index (on-line), Ancestry.com, SSDI, Ancestry.com, SSAN 361-24-1182. Mrs. Lucille Irene Holcomb, 51, wife f David D. Holcomb 1st, of Madison Township, Gibsonburg Route 2, died Friday afternoon at her home after having been seriously ill the last seven months. She was a lifelng resident of the Gibsonburg area and was bory July 18, 1903, in Scott Township. She was a daughter of B. L. Smith and Maude (Garner) Smith of Helena. She and Mr. Holcomb were married in Fremont September 12, 1922. Surviving are sons, David II, Richard, William, Michael and John all at home; Merle of Gibsonburg and George, in the Army at Fort Benning, GA; brothers, Richard of Helena, Herbert of Burbank, Calif., David of Clyde and Virgil Smith of Bradner; a sister, Mrs. James Alcorn, Temperance, Mich., her parents and three grandchildren. She was preceded in death by a brother and a sister. Friends may call at Veh and Son Mortuary, Gibsonburg. Services will be conducted at the mortuary, Monday at 2 p.m. by the Rev. H. M. Maurer. Burial will be in Quinshan Cemetery. [S807] Find A Grave, online http://www.findagrave.com, Find A Grave, database and images (https://www.findagrave.com : accessed 9 April 2019), memorial page for Lucille Irene Smith Holcomb (18 Jul 1903–3 Sep 1954), Find A Grave Memorial no. 14730347, citing Quinshan Cemetery, Gibsonburg, Sandusky County, Ohio, USA ; Maintained by John Tate (contributor 47119982) . Wenzel Mischler was born on 20 December 1838 at Darmstadt, Hesse, Deutschland. He married Sarah Hartman, daughter of Georg Leonhard Hartman and Catherina Elizabeth Schaufelberger, on 14 March 1860 at Zion Lutheran Church, Sandusky, Erie Co., OH. Wenzel Mischler died on 19 September 1921 at Sandusky, Erie Co., OH, at age 82. Sarah Hartman was born on 28 December 1841 at Danbury Twp., Ottawa Co., OH. She was the daughter of Georg Leonhard Hartman and Catherina Elizabeth Schaufelberger. Sarah Hartman married Wenzel Mischler on 14 March 1860 at Zion Lutheran Church, Sandusky, Erie Co., OH. Sarah Hartman died on 18 January 1929 at Sandusky, Erie Co., OH, at age 87. Benjamn Lewis Smith was born on 19 June 1878 at Scott Twp., Sandusky Co., OH. He was the son of Richard Smith Jr. and Margaret Ann Von Thurn. Benjamn Lewis Smith married Maude S. Garner on 17 March 1902. Benjamn Lewis Smith died on 21 February 1964 at age 85. Maude S. Garner was born on 12 August 1884 at Rollersville, Sandusky Co., OH. She married Benjamn Lewis Smith, son of Richard Smith Jr. and Margaret Ann Von Thurn, on 17 March 1902. Maude S. Garner died on 25 April 1964 at age 79. Richard Smith Jr. was born on 8 August 1844 at Long Sutton, England. He married Margaret Ann Von Thurn, daughter of Johann Jacob Thurn and Katherine Mary Waggoner, on 5 October 1868. Richard Smith Jr. died on 11 November 1933 at Bradner, Wood Co., OH, at age 89. Margaret Ann Von Thurn was born on 23 January 1847 at Ottawa Co., OH. She was the daughter of Johann Jacob Thurn and Katherine Mary Waggoner. Margaret Ann Von Thurn married Richard Smith Jr. on 5 October 1868. Margaret Ann Von Thurn died on 10 August 1923 at Bradner, Wood Co., OH, at age 76. Child of Margaret Ann Von Thurn and Richard Smith Jr.
Gibsonburg resident, David D. Holcomb, Jr., age 90, passed away on Thurs., Dec. 3, 2015 at Bethesda Care Center, Fremont. Born on March 29, 1925 in Sandusky, OH, he was a son of David D. & Lucille (Smith)Holcomb, Sr.
David was a 1944 graduate of Gibsonburg High School. Following high school, he served in the U.S. Army from Sept. 27, 1944 to July 26, 1946. He later worked at the former Pfizer Lime Plant as a kiln operator, retiring in 1983. David was a member of Restored Church of God. David is survived by brothers, Richard and John of Gibsonburg and Michael of Florida. He is preceded in death by parents; and brothers, Merle, William, and George. Visitation will be on Sun. 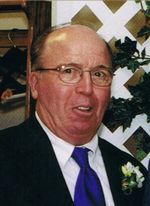 Dec. 6, 12:00-2:00 p.m., at the Herman-Veh Funeral Home & Cremation Services, Gibsonburg where Funeral Services will begin at 2 p.m.
[S807] Find A Grave, online http://www.findagrave.com, Find A Grave, database and images (https://www.findagrave.com : accessed 9 April 2019), memorial page for David Delmar Holcomb, Jr (29 Mar 1925–3 Dec 2015), Find A Grave Memorial no. 155674294, citing West Union Cemetery, Gibsonburg, Sandusky County, Ohio, USA ; Maintained by John Tate (contributor 47119982) . Rural Gibsonburg resident, Richard Holcomb, 89, died Friday morning, June 30, 2017 at the Bethesda Care Center, Fremont. Born in Gibsonburg on Nov. 12, 1927, Richard was one of seven boys of David D., Sr. and Lucille (Smith) Holcomb. As a graduate of Gibsonburg High School, he served our country, enlisting in the Army during the Korean Conflict. He was a Medic, enlisted from Sept. 22, 1950 and discharged on Sept. 22, 1952. Richard then began working as a laborer for the former Pfizer Lime Plant where he later retired. In his younger years, Richard was known to enjoy the outdoors, hunting and fishing. He is survived by brothers, John of Gibsonburg and Michael of Florida; and many nieces and nephews. Richard is preceded in death by his brothers, David, Jr., Merle, George and William. Visitation will be Sunday, July 2, 2017, noon-2 p.m., at the Herman-Veh Funeral Home & Cremation Services, Gibsonburg where Funeral Services will begin at 2 p.m. Burial with Military Rites will follow at West Union Cemetery, Gibsonburg. Memorial donations may be directed to Bethesda Care Center, Fremont. [S807] Find A Grave, online http://www.findagrave.com, Find A Grave, database and images (https://www.findagrave.com : accessed 9 April 2019), memorial page for Richard Angus Holcomb (12 Nov 1927–30 Jun 2017), Find A Grave Memorial no. 180876023, citing West Union Cemetery, Gibsonburg, Sandusky County, Ohio, USA ; Maintained by John Tate (contributor 47119982) . [S807] Find A Grave, online http://www.findagrave.com, Find A Grave, database and images (https://www.findagrave.com : accessed 9 April 2019), memorial page for Hazel Gayetta “Gay” Smith Holcomb (11 May 1932–24 Jun 2015), Find A Grave Memorial no. 148235165, citing West Union Cemetery, Gibsonburg, Sandusky County, Ohio, USA ; Maintained by John Tate (contributor 47119982) . [S807] Find A Grave, online http://www.findagrave.com, Find A Grave, database and images (https://www.findagrave.com : accessed 9 April 2019), memorial page for Merle James Holcomb (24 Nov 1929–24 Sep 2006), Find A Grave Memorial no. 79327699, citing West Union Cemetery, Gibsonburg, Sandusky County, Ohio, USA ; Maintained by John Tate (contributor 47119982) . Hazel G. "Gay" Holcomb, 83, of Pemberville, passed away on Wednesday, June 24, 2015 at Otterbein Portage Valley, Pemberville. She was born in Jackson Twp. on May 11, 1932 to Dale and Mildred (Inks) Smith. In1950, Gay graduated Jackson-Burgoon High School. She went on to work for Pearce Insurance in Fremont and Securance Service in Woodville as a secretary until her retirement in 1997. Gay loved playing cards and attending her grandchildren's sporting events. She was a member of Bethlehem Lutheran Church, Pemberville. On October 21, 1950, Gay married Merle Holcomb. He preceded her in death on Sept. 24, 2006. Surviving are their children, Doug (Janell) Holcomb of Fremont, Jeff (Linda) Holcomb of Gibsonburg, Denny (Christi) Holcomb of Sugarland, TX, and Amy (Rod) Lanning of Bowling Green; 11 grandchildren; 15 great-grandchildren with one due in August; and sisters-in-law, Linda Holcomb of Gibsonburg and Pat Smith of Oak Harbor. She is also preceded in death by her parents and brother, Terry Smith. Family and friends will be welcomed to the Herman-Kinn-Veh Funeral Home & Cremation Services, 319 W. Madison St., Gibsonburg, OH 43431 on Tuesday, June 30, 2015 from 4-8 p.m. Funeral Services will be held Wednesday, July 1, 2015, 11 a.m. at Bethlehem Lutheran Church, 220 Cedar St., Pemberville, OH 43450 where her body will lie in state one hour prior to the services. Pastor Matt Musteric will officiate, and burial will follow at West Union Cemetery. George J. Holcomb, 80, passed away at his rural Gibsonburg home on Tuesday, Sept. 3, 2013. Born in Scott Township on Nov. 11, 1932, George was a son to the now deceased David and Lucille (Smith) Holcomb. He graduated from Gibsonburg High School in 1952 and later joined the Army, serving during the Korean Conflict. George worked at the former Ohio Lime Stone Company in Woodville for over 26 years, retiring in 2001. He was a member of the Zion Evangelical Lutheran Church in Gibsonburg, the Gibsonburg Post of the American Legion, a former member of the United Steelworkers' Union and a former worker at the Mansfield Speedway. He was known to be a history buff and enjoyed tinkering with outdoor projects. He also was a regular at the Rollersville-Helena School Group Reunions. In 1973 he married Linda Fox at Zion Lutheran. She survives. Also surviving are children Danny (Evie) of Citrus Springs, FL, Luanne Riggs of Lake City, FL, Melody (Roger) Holding of Crystal River, FL, Michelle (Jerry) Ketcham and Heather (Craig) Rubel all of Gibsonburg; 21 grandchildren; 28 great-grandchildren; and siblings David and Richard Holcomb of Gibsonburg, Michael (Marcia) of Riverview, FL and John of Gibsonburg. He is preceded in death by his parents; son, Randy; and siblings Merle and William. Funeral services will be on Monday, Sept. 9, 2013, 10:30 a.m., at the Zion Evangelical Lutheran Church in Gibsonburg where his body will lie in state for an hour prior to the services. Rev. Blair Miller will officiate. Friends and family will be welcomed at the Herman-Kinn-Veh Funeral Home & Cremation Services on Sunday, Sept. 8, 1-5 p.m.
Burial with military rites will be at West Union Cemetery, Gibsonburg. In lieu of flowers, memorial contributions may be directed to the care of his family or the Zion Lutheran Church. [S807] Find A Grave, online http://www.findagrave.com, Find A Grave, database and images (https://www.findagrave.com : accessed 9 April 2019), memorial page for George J. Holcomb (11 Nov 1932–3 Sep 2013), Find A Grave Memorial no. 116539406, citing West Union Cemetery, Gibsonburg, Sandusky County, Ohio, USA ; Maintained by John Tate (contributor 47119982) . William P. Holcomb, 65, of Gibsonburg died Monday evening in Alvada. He was born in Gibsonburg to David D. and Lucille I. (Smith) Holcomb. Bill was a 1958 graduate of Gibsonburg High School and U.S. Army veteran serving during peacetime. He was a member of Trinity United Methodist Church, Gibsonburg, and participated in its Sunday school and Bible study group. He enjoyed his grandchildren's athletic games and playing on an area men's softball league himself. Bill was a former member of the Toastmasters group and devoted his life to the Lord and tried living by His word. Surviving are children, Jerry Muncy of Fremont, Edwin Muncy of Hillsboro, Ohio, Charlene Miller of Gibsonburg, Kyle Holcomb of Gibsonburg, Michael Holcomb of Alvada and Holly Worthington of Wayne; 16 grandchildren; brothers, David, Richard, George and John of Gibsonburg, Merle of Pemberville, and Mike of Florida. His parents preceded him in death. [S807] Find A Grave, online http://www.findagrave.com, Find A Grave, database and images (https://www.findagrave.com : accessed 9 April 2019), memorial page for SPC William Plin “Bill” Holcomb (26 May 1940–17 Oct 2005), Find A Grave Memorial no. 12110320, citing West Union Cemetery, Gibsonburg, Sandusky County, Ohio, USA ; Maintained by John Tate (contributor 47119982) . [S295] Gail Headlee, "Laura Case," e-mail to James H. Holcombe, 5 Nov 2000.